Although these morphological forms may be recognizable in the field, distinguishing these differences in herbarium specimens is often difficult, and there is much overlap occurs in expression of the characteristics supposedly defining infraspecific taxa. Numerous intermediate forms exist, including putative hybrid populations be tween the subspecies with 2n = 42 (D. G. Huttleston 1949, 1953). Given these problems and the sympatric ranges of the 'subspecies' recognized by previous workers, A. triphyllum is treated here as one highly variable species. In addition to the above variability within the Arisaema triphyllum complex, putative hybrid populations between A. triphyllum and A. dracontium also occur naturally (L. L. Sanders and C. J. Burk 1992). These plants do not produce mature fruits but do reproduce vegetatively. Perennial herb 15 cm - 0.9 m tall Leaves: usually two, long-stalked, with three leaflets (rarely five). The leaflets are more or less stalkless, to 30 cm long and 20 cm wide, with the terminal leaflet elliptic to broadly egg-shaped and the lateral leaflets usually asymmetrical and sometimes lobed or divided. Inflorescence: of many tiny flowers borne tightly clustered on the bottom half of a spike with a very fleshy axis (spadix), with male flowers above female flowers, The spadix is yellow, 3 - 9 cm long, and cylindric to slightly club-shaped with a blunt tip. The leaf-like sheath (spathe) surrounding the inflorescence forms a green tube sometimes striped or marked with purple or white, expanding near the tip to form a long tapering hood over the inflorescence. Fruit: a 6 - 15 mm long cluster of nearly spherical red berries, each with one to three seeds reaching 3 - 5 mm across. Similar species: Arisaema species have compound leaves as well as flowers that only cover the bottom half of the spadix. Arisaema draconitum is distinguished by having five to fifteen leaflets and a tapering spadix that protrudes beyond the spathe. Arisaema triphyllum is represented by two subspecies in the Chicago Region. See links below for further information. Habitat and ecology: Common in rich woodlands. Etymology: Arisaema comes from the Greek words aron, meaning Arum, and haima, meaning blood, referring to the blotchy red leaf color of some species. Triphyllum means three-leaved. Infrequent to frequent throughout the state in moist, rich woodland. It is a shade-loving species, found from the alluvial plains to the crests of the highest ridges and seems to have no correlation with Arisaema dracontium in its distribution. A study of my 69 specimens from Indiana shows that they have green and purplish spathes but very few have the hood purplish above, none flower as late as the middle of June, and none have been found in bogs. This species is extremely variable in the color of its spathe, in the shape of the blade of its hood, and in the shape of its leaflets. I have a specimen from De Kalb County with 4 leaflets and one each from Lake and Steuben Counties with the lateral leaflets parted. 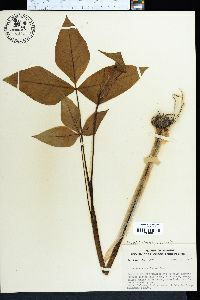 [Deam says the following about A. pusillum (a form in which the spathes are purplish brown both within and without):] A comparison of specimens of Arisaema deflexum with a series of specimens of Arisaema pusillum from Maine, Connecticut, Pennsylvania, and New York shows no essential difference. In fact, Arisaema pusillum itself seems to be only an extreme form of Arisaema triphyllum and it is reduced to synonomy in the Gray Manual, but is maintained as a species in Britton and Brown, Illustrated Flora, ed. 2. Wiegand and Eames in their flora of the Cayuga basin say: "It has not been possible to separate A. pusillum (Peck) Nash in this region from the species (A. triphyllum) by any constant characters." My opinion is that this plant as found in Indiana is only a well marked form or variety of [A. triphyllum]. It has been found as yet only in St. Joseph County where it grew in bogs.